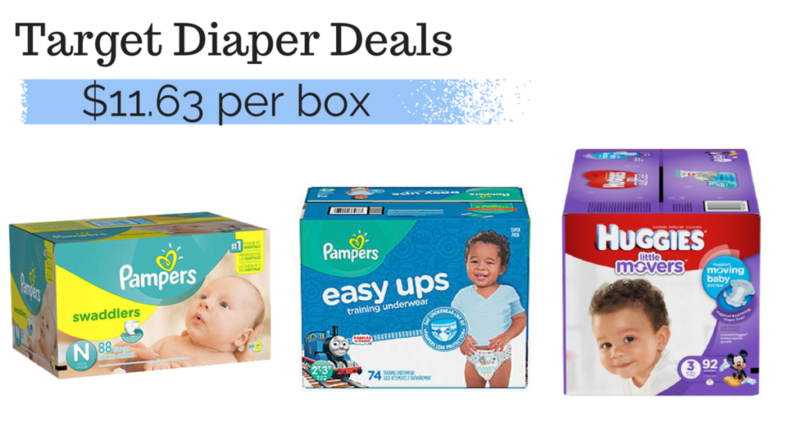 Home > Baby Deals > Target Diaper Deals – Cases of Pampers & Huggies Starting at $11.63! Target Diaper Deals – Cases of Pampers & Huggies Starting at $11.63! This week Target has an in-ad or in-app coupon for a $30 Target gift card when you buy $100 in baby wipes, diapers or toiletries. This is the highest offer they have ever given us on baby items! The sweet part about these offers is that you can still use other coupons with them. As long as your total is $100 before coupons, you’ll get the $30 gift card back! Here are two ideas for you, one of them you can do without even leaving the house!! Note: I made both of these plans using the discount from the Target Red Card. There is really no reason to not have one, it can be a debit card and will save you 5% off every purchase, forever!